Today is going to be an interesting day… We’ll get to those fun stories in a bit. We turned the lights out early last night and by 9pm I was fast asleep. I barely stirred the entire night. Unfortunately at 1:10am, I woke up and was wide awake. I laid in bed until 1:30am but couldn’t fall back asleep. This seems to be typical when we cross a few time zones. I read my book until Theresa woke up around 3:30am. We got all our bags packed up and left the room around 5am. The airport is literally right next door so we walked over there for breakfast. 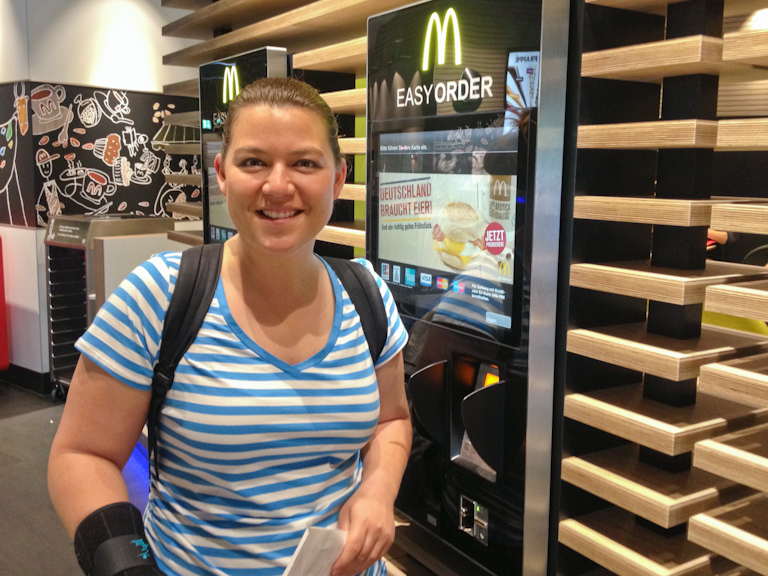 The only thing open at that time was the McDonalds so we ordered off an automated touch-screen and soon picked up our food. T got an egg mcmuffin with bacon. 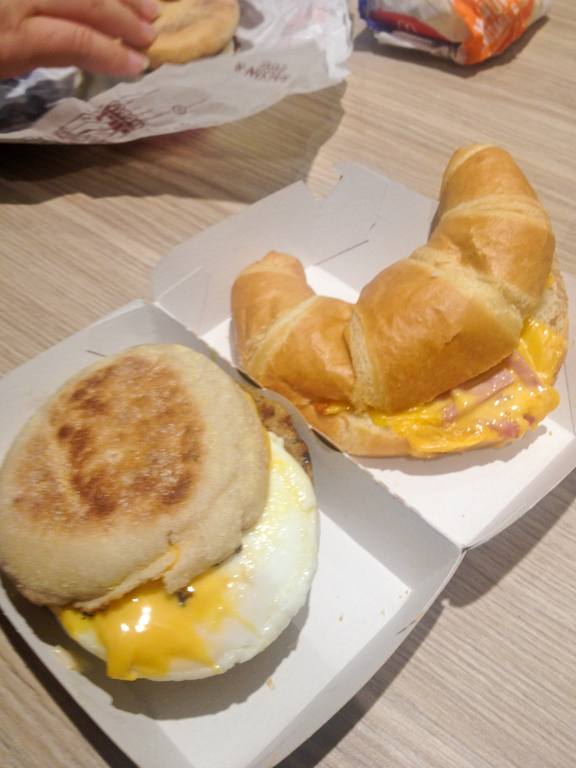 I got a sausage mcmuffin and a ham and cheese croissant. The croissant wasn’t very good, but I’m glad I tried it anyway. We breezed straight through security. They only checked our boarding pass and no IDs or even passports. 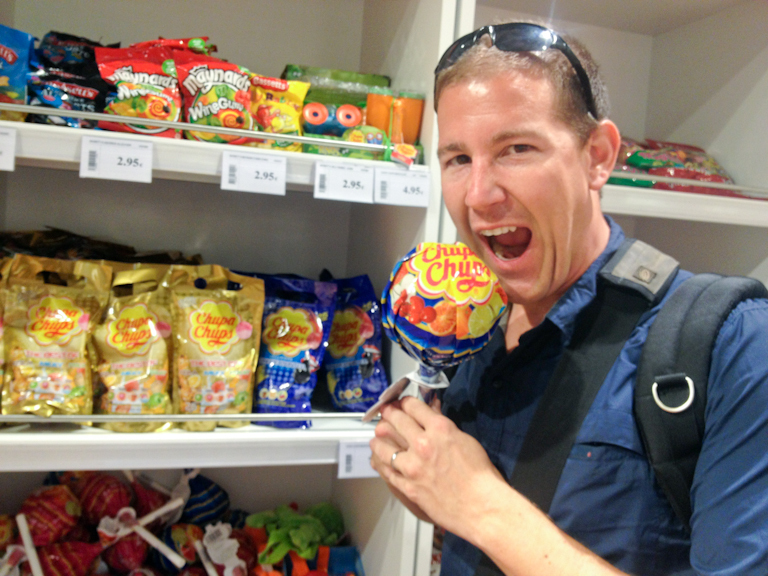 One of my many nicknames from T is Chupa Chup, so of course after seeing a giant one, a picture is required. We boarded our flight right on time. 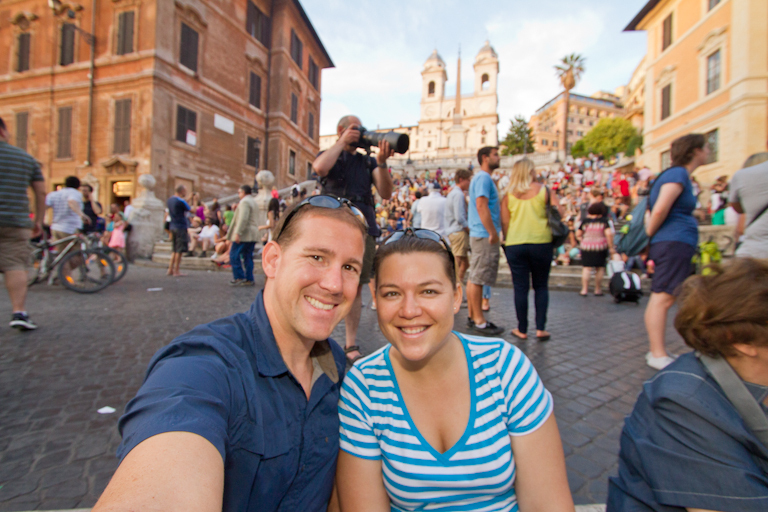 We took a bus over to the plane, climbed the jet bridge and flew to Rome. 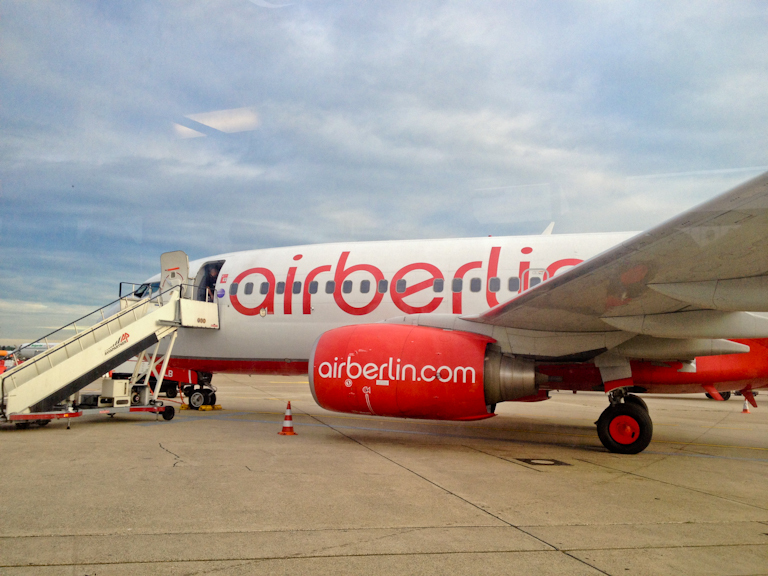 There wasn’t anything special about the flight. Just 1:45 minutes later, we landed. 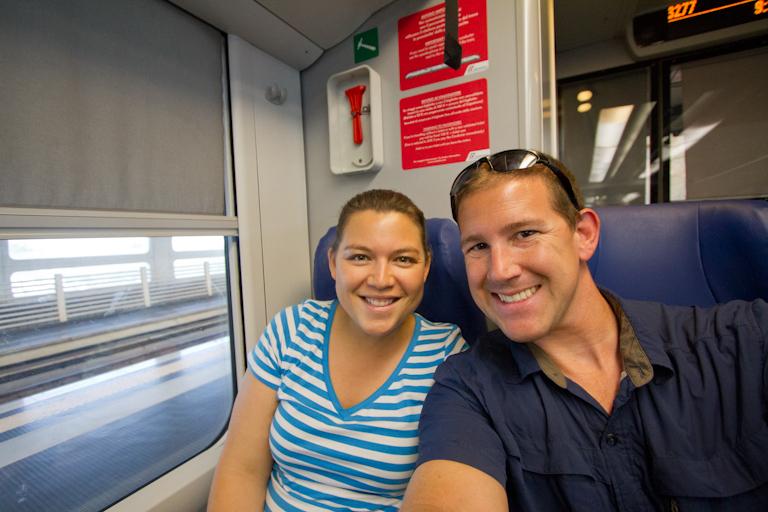 With no checked bags, we got off the plane and headed straight to the Leonardo Express train into the Termini station in the middle of Rome. The airport is 15 miles from city so it's either the train or a taxi. When we got to the station, there was a train there and leaving in 6 minutes. We grabbed our tickets from the green and white automated station with no problems. The guard manning the gate validated our ticket and we jumped on the train. 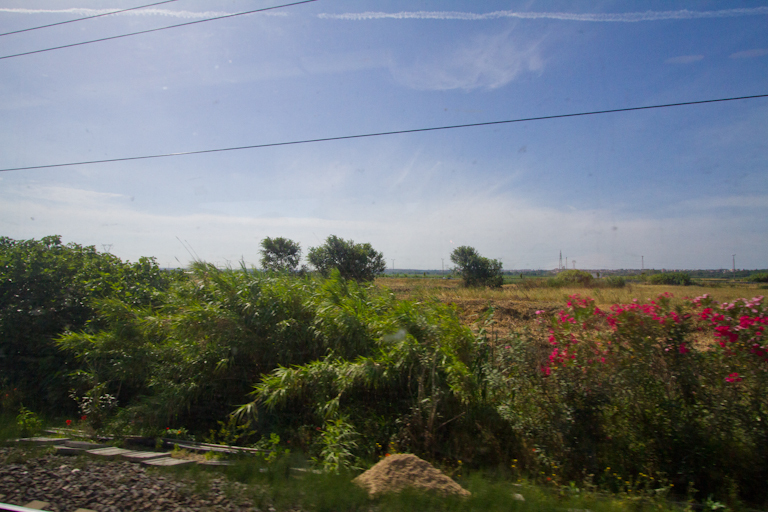 Within 3 minutes, the train took off and we were on our way into Rome. We started in the beautiful country. But before too long we were into the city. The thing we noticed here was the ridiculous amount of graffiti everywhere. It was mostly in the areas with lots of apartment complexes. So do the two go together then? T booked us a great hotel right in the middle of the city. 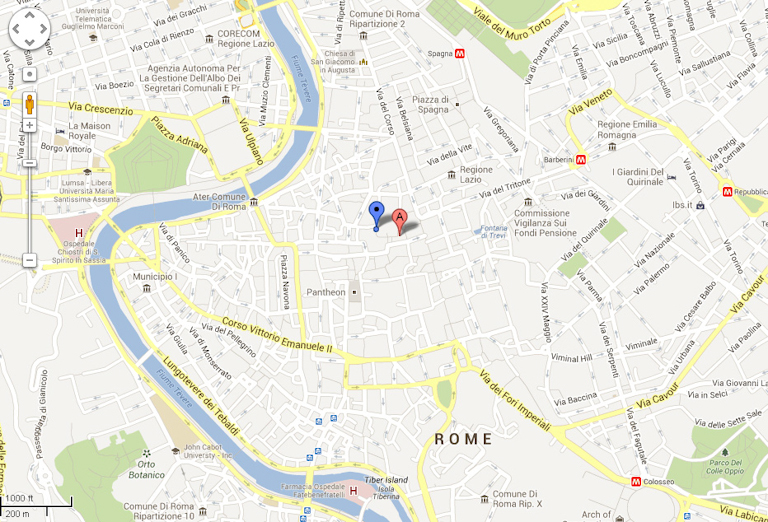 The Vatican is to the West, Pantheon is a couple blocks South, Coliseum is South East, Trevi Fountain a couple block East. 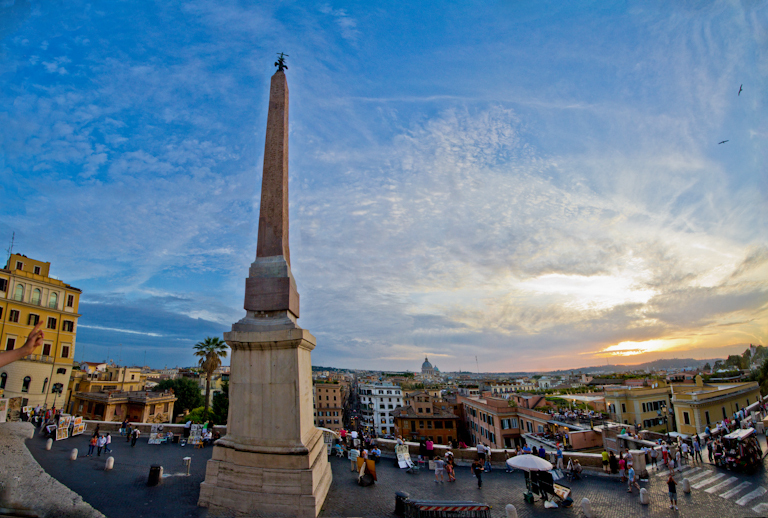 We're really right in the middle of Rome. 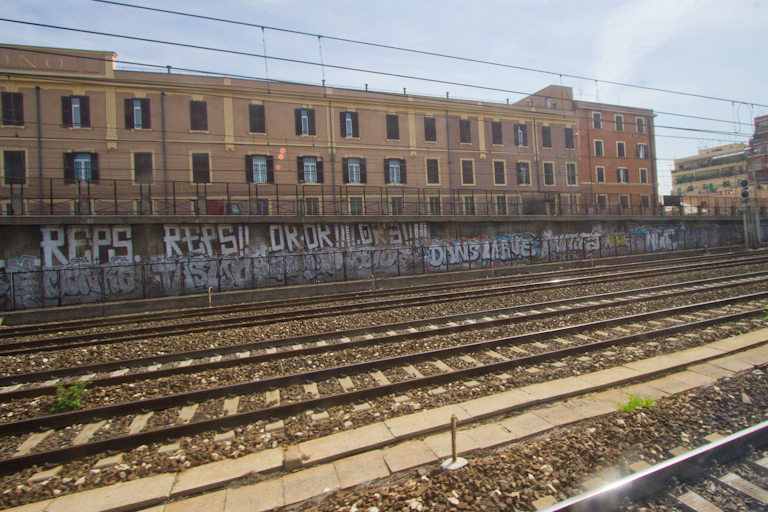 At Termini, we got off the train and walked to the taxi stand. Of course we were approached by the unofficial taxi drivers, but we kept a straight face and ignored them and they didn’t bother us. After just a few minutes we were at the front of the taxi line. A guy whipped his taxi up, T asked if he knew where the Hotel Nazionale was, and he said he did. We jumped in the taxi and took off. This guy was yelling and motioning with his hands at everyone on the road. When a scooter wasn’t fast enough at a light, he sped around him and jerked right back in front of him. I don’t even know why they put lane lines on the roads because we were all over the place. 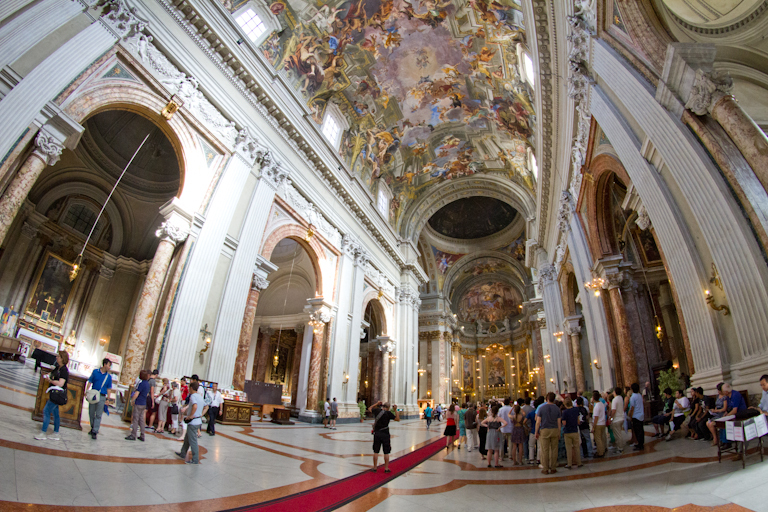 T of course got quite a headache and vowed that we'd no longer be using taxis while in Rome. After a few minutes, the driver pulled over and said he wasn’t exactly sure where the hotel was, so Theresa showed him the paper with the name and the address. The address on T's paper just confused him and he said in broken English that it wasn’t here (whatever that meant). I found the hotel in the Rick Steves’ travel guide and showed him, and then he knew where we wanted to go. We wind through quite a few small back roads then pulled up to an obelisk and he said it was right around the corner. Theresa was so sick and had such a headache, that even though we couldn’t see our hotel she was ready to get out of that car. We walked around the corner. There it was! 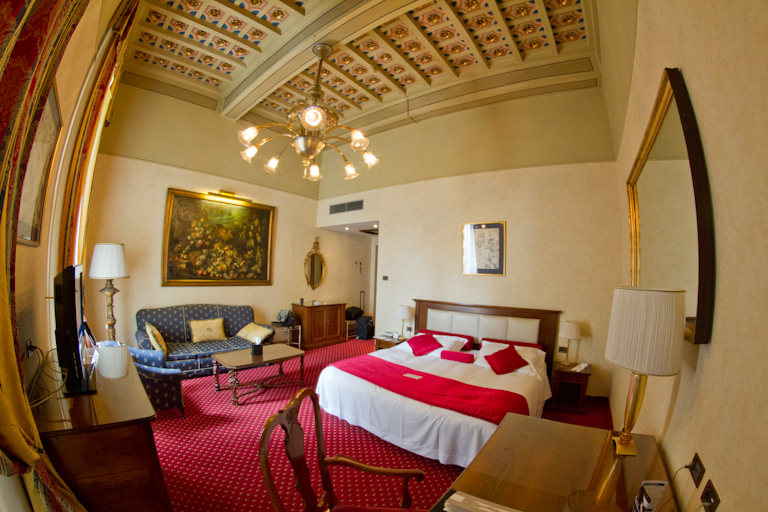 The Hotel Nazionale! We walked inside and were greeted at the front desk. They asked our name, but couldn’t find our reservation. Hmm. Theresa had the confirmation number written down, but they didn’t recognize it either. After a few minutes of trying to figure out why our reservation wasn't showing up, I put 2 and 2 together with what the taxi driver said about the address and showed that to Roberta, the receptionist. With that, everything was clear. 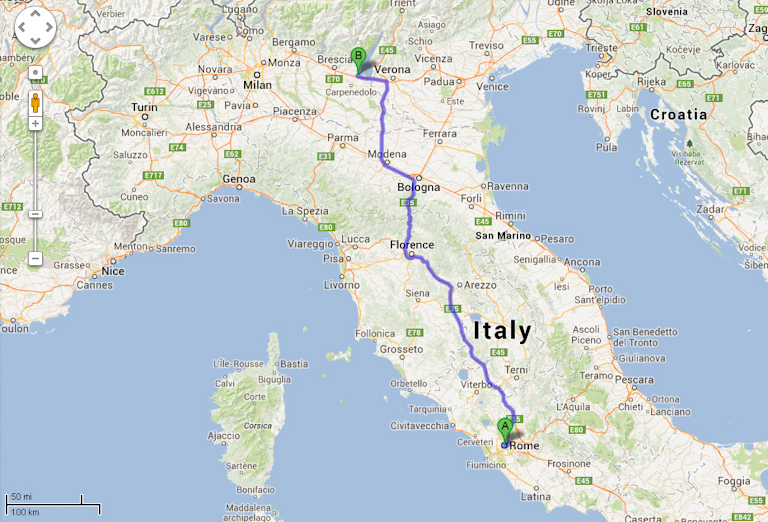 The Hotel Nazionale we had booked was in the far north of Italy and no-where near Rome. Uh-oh. Roberta was absolutely fantastic though. Once she figured out what had happened she went to work. We made small talk and she asked if we were celebrating our honeymoon. We said no, but I rubbed Theresa’s belly saying that we were celebrating. She was exited for us and said “Oh, so there’s three of you staying here.” She suggested we go sit down while she made some phone calls. Theresa had the price of the other hotel written down, and Roberta said she didn’t think she’d be able to match the 690 Euro we had paid. 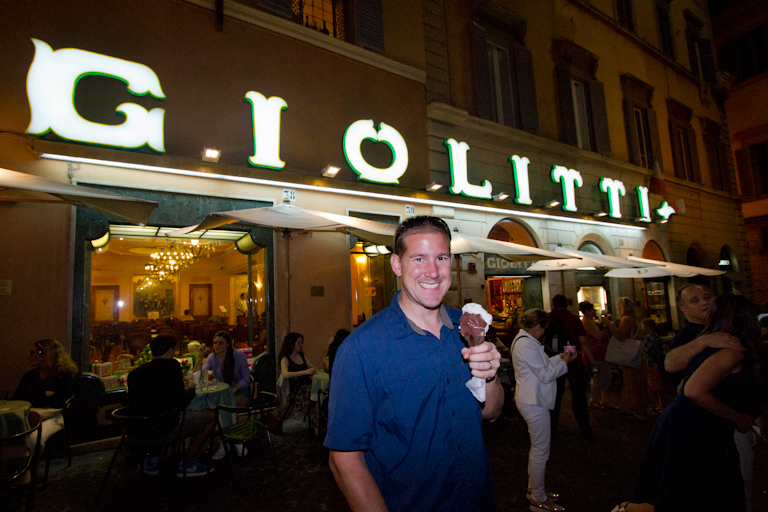 We totally understood that because it was off in a much smaller city, and this was in the middle of Rome. After 20 minutes or so, she told us she called the manager of the other hotel and actually was friends with him. 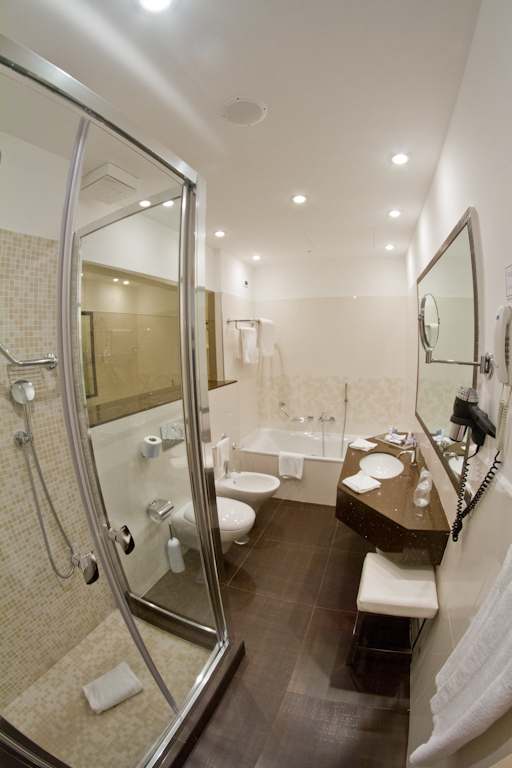 He said the city was very busy and he would be able to resell our room and would refund us our money. Wonderful! Theresa and I had looked up how much it would be to book a room with this hotel directly and saw the cheapest room for four nights was 1090 Euro. Ouch. Roberta was on top of that one too for us. 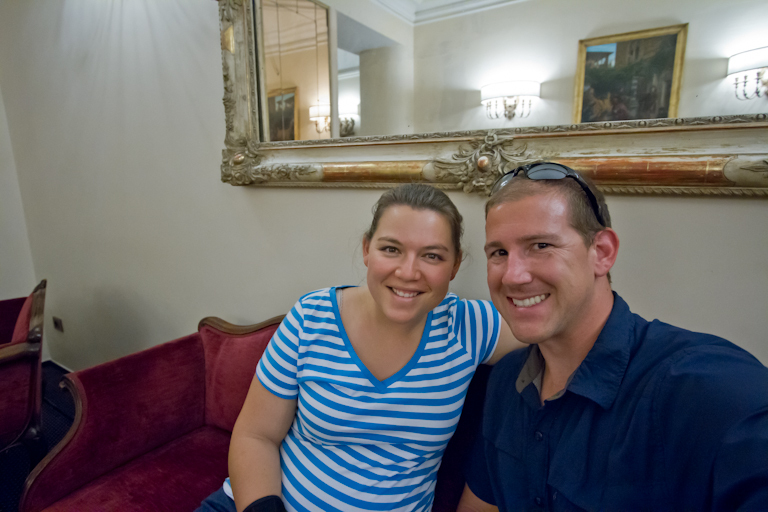 She looked through all their discounted rates and was able to book us in a room for 960 Euro. Of course we were thrilled with that. When we walked up to our room and went inside, we were even more amazed. Roberta had done us one even better than that. 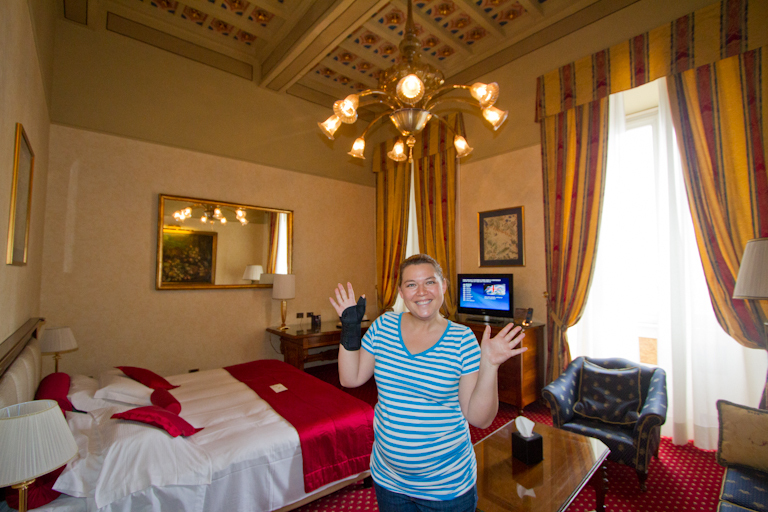 Instead of the standard room, she put us in the Executive room for a much cheaper price than we would have paid. The room is huge, the ceilings are 18 feet high, and we’ve got a soft king sized bed. Amazing! 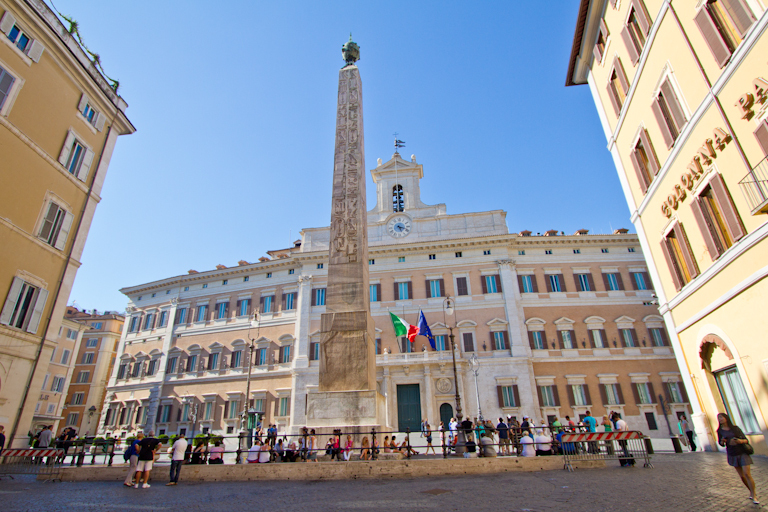 And we even have a great view of Piazza di Monte Citorio. Theresa decided she wanted to take a nap to sleep off her headache. She laid down at 12:15 and said she only wanted to sleep for an hour or so. I rubbed her head for 15 minutes and by then she was out cold. I was reading my Angels & Demons book (because it’s set in Rome), and around 12:45 I just couldn’t keep my eyes open. I took a nap, which I never do, and at 3:00pm Theresa was waking me up, saying we had slept a lot longer than an hour. We got ready to go explore and stopped by the front desk for some suggestions. They told us a restaurant just around the corner that was pretty good. 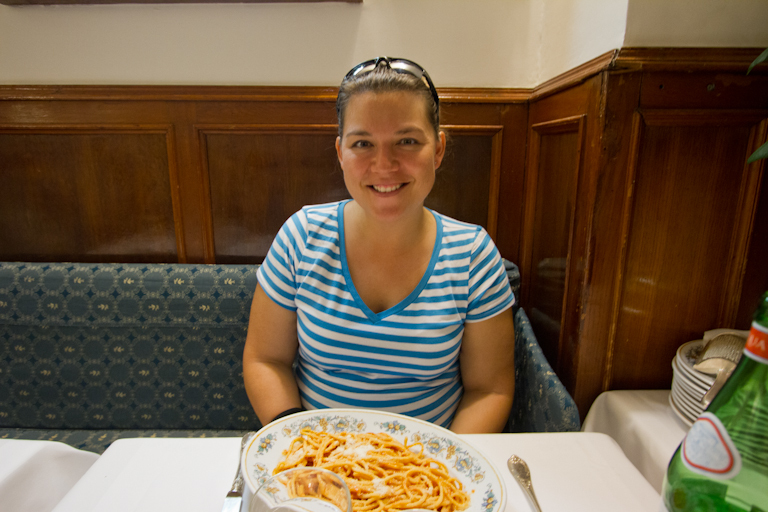 Theresa was really hungry at this point, and when we found the street the place they suggested was on, she decided to stop at the very first restaurant she saw, completely forgetting it wasn’t the one that was suggested. 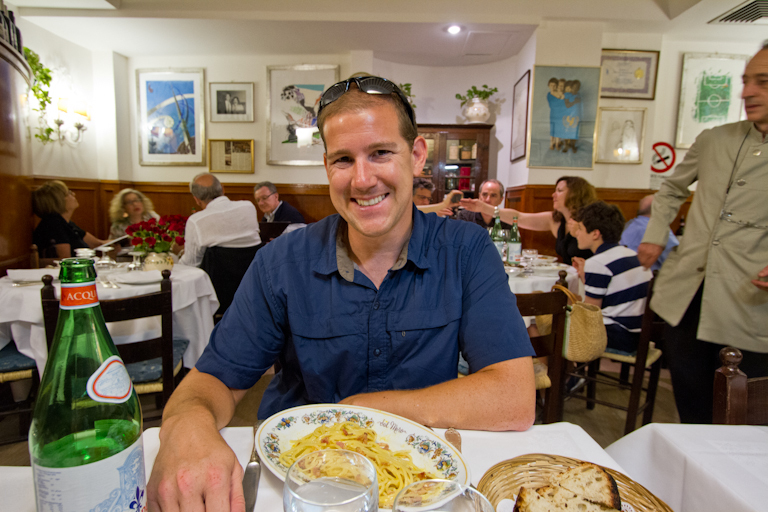 We ordered plain spaghetti plus lasagna, because the last time we were in Italy that was the best lasagna we’d ever tasted. We asked for tap water, but were given bottled anyway. 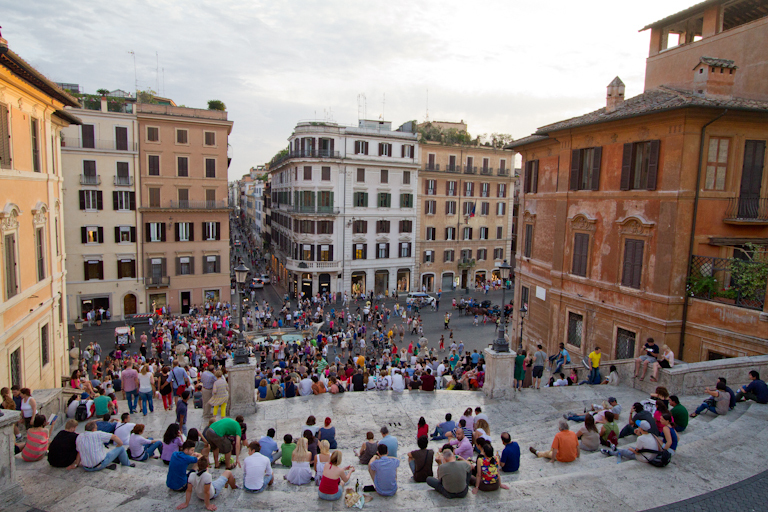 According to Rick Steves’ that’s pretty typical and they pretend not to understand. They asked if we’d like bruschetta and since it’s a favorite of Theresa’s she said yes. They brought out two portions, one for each of us I guess. Now it really feels like a tourist trap. I tried the bruschetta with some balsamic vinegar and it was actually pretty tasty, which surprised me! Then the meal came. Neither of us were impressed. The lasagna was just a huge mess plopped onto a plate, and the spaghetti wasn’t much better. After 5 bites, Theresa was done, declaring it the worst spaghetti she’d ever had. We paid 30 Euro for our meal and left feeling unsatisfied. 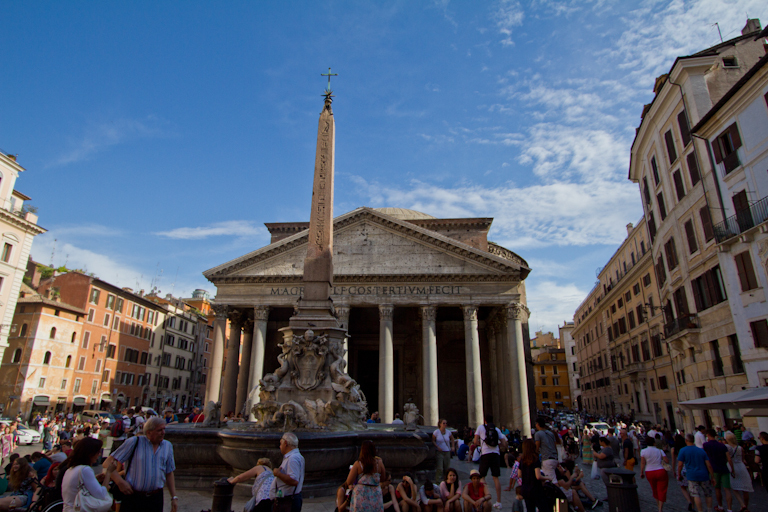 Just down the street was the Pantheon. It was the typical zoo we were expecting to see, and we couldn’t go inside because it was 4:30pm and time for mass. We better make it inside during this trip. On our last visit it was closed and we never saw it. 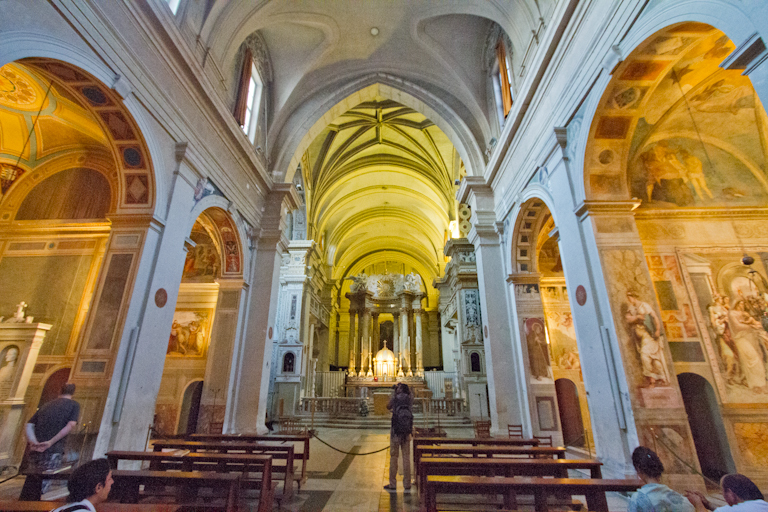 The Church of Saint Ignatius of Loyola is just down the street and it's still open, so we go explore the first of many churches on this trip. As we entered, there was an organ playing music. I told Theresa I was enjoying the organ, and she paraphrased one of her favorite movies, Chocolat. “The organ is not intended as an entertainment. It is a solemn call to worship.“ We learned that it was playing because at the front of the church was a couple getting married. Pretty huge place to get married! 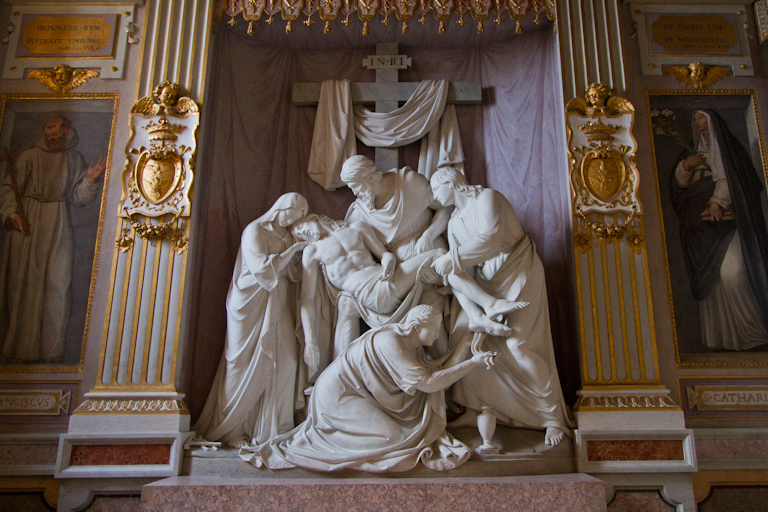 We wandered the church, marveling at all the statues and paintings. It impresses me when they make stone look completely like something soft, like cloth or drapery. 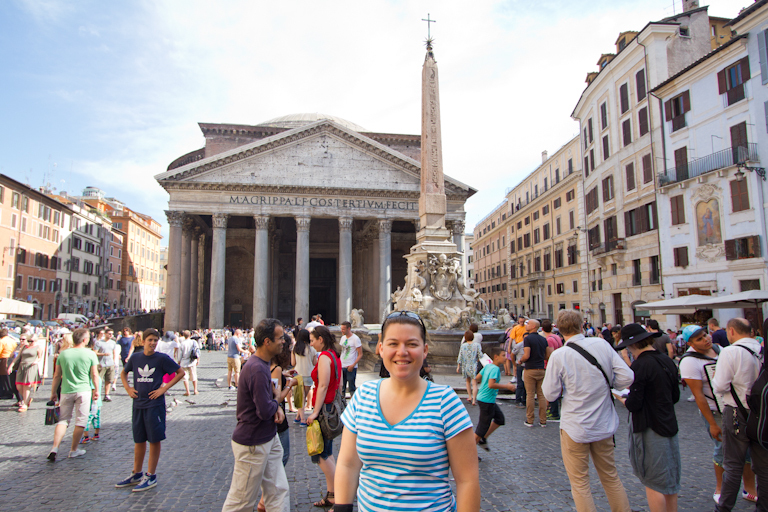 We crossed back in front of the Pantheon to find a grocery store. 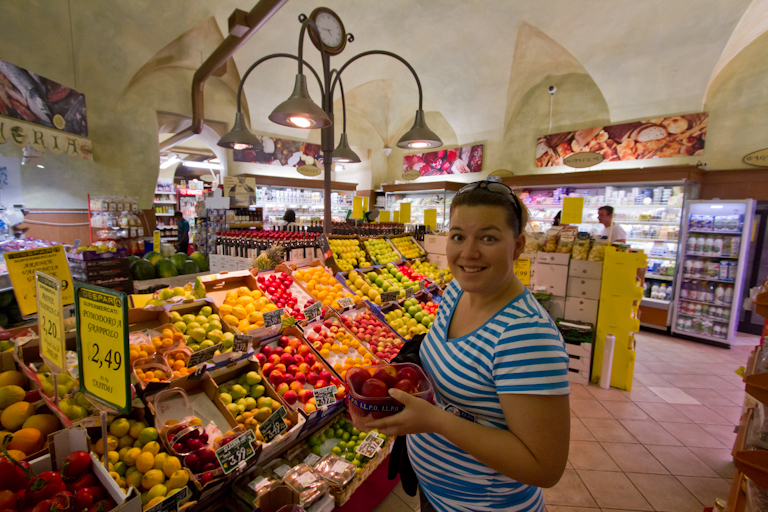 It wasn’t a huge place, and the prices are expensive, but we got some necessities. Being pregnant, T's only real craving has been fruits and vegetables, so we stock up. A short walk and we were back at the hotel to drop everything off. 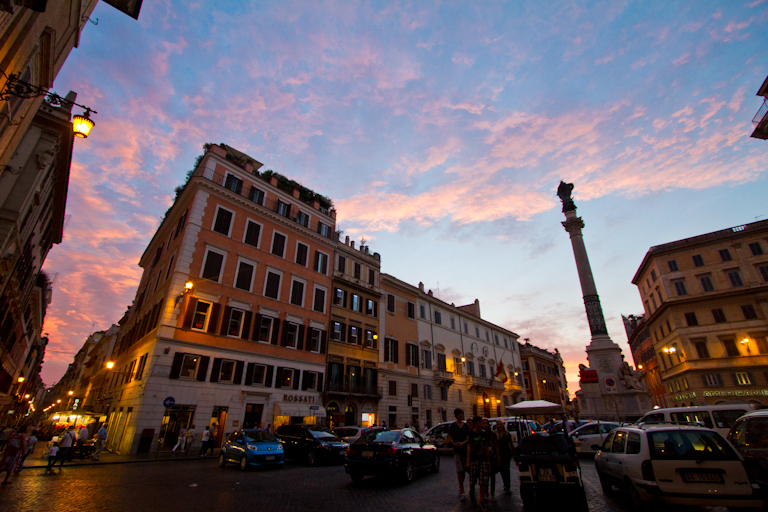 At 6:30, we got recommendations from the front desk on where to eat dinner, and started half of the Rick Steves Heart of Rome walking tour. 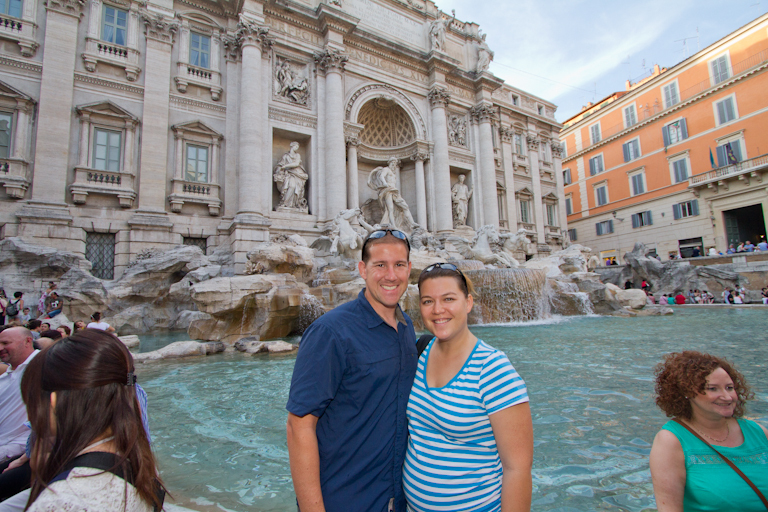 Our first stop was the Trevi fountain. It was crazy busy of course, but we made our way down to the front. We asked a couple to take our picture, and then we took theirs. Theresa must look very trustworthy because lots of people were asking her to take their picture. There were plenty of guys who would take your picture then ask to take one of you with their polaroid camera to sell to you. They were all over the place and constantly asking. 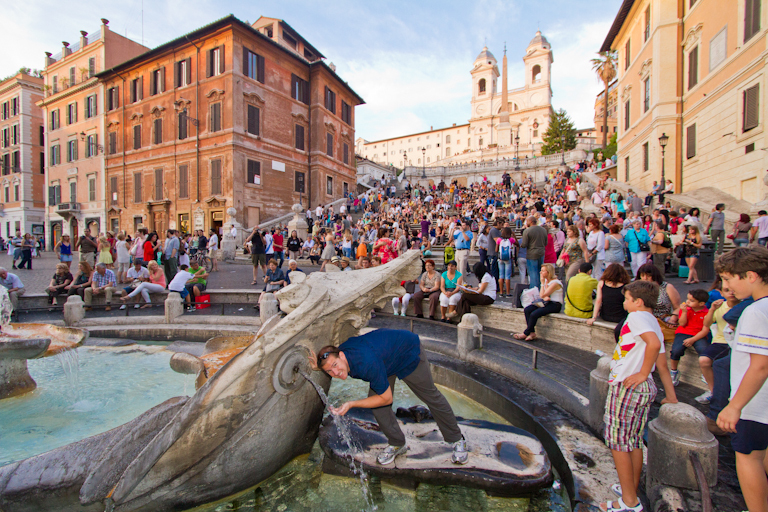 As is tradition, we each tossed a coin in the fountain, ensuring we'd someday return to Rome. 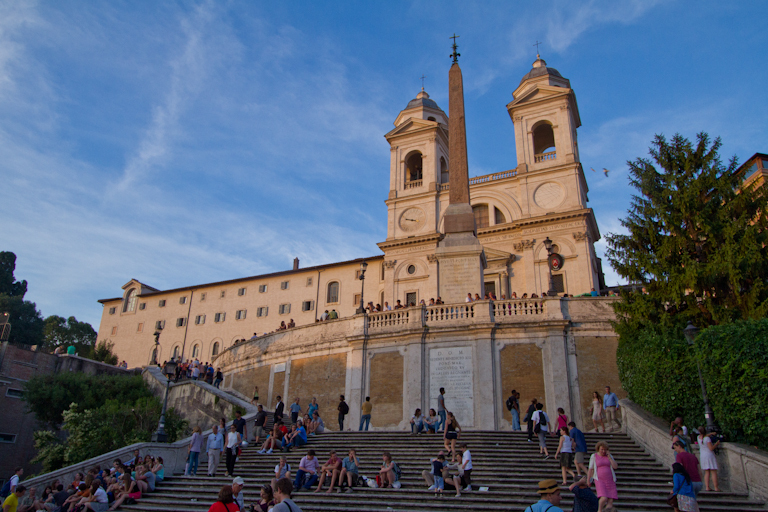 Our next stop is the Spanish Steps. It was just a short walk away and of course, very crowded. 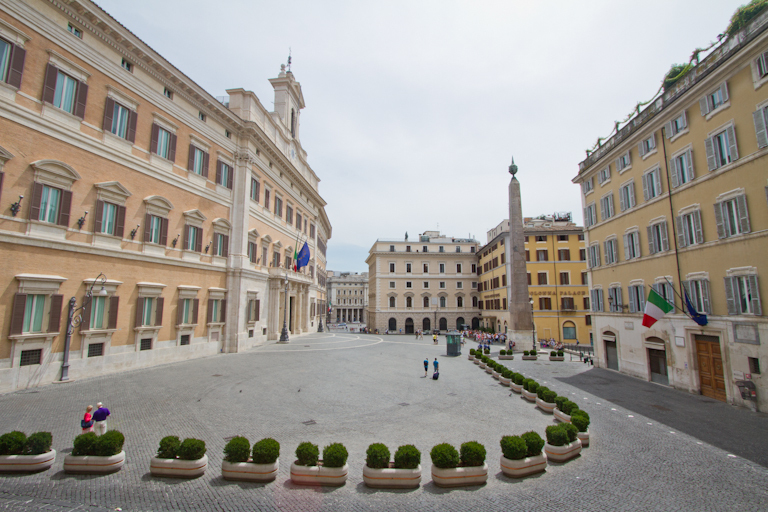 There are 135 steps connecting the Spanish Embassy and church at the top to Piazza di Spanga below. 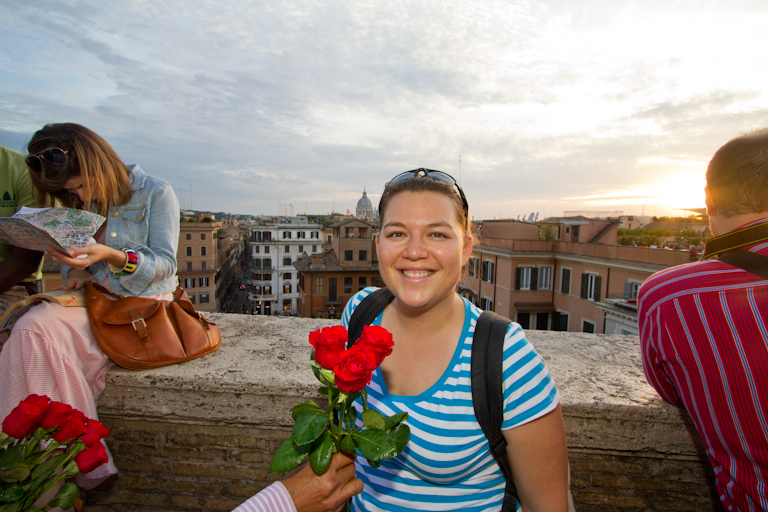 There are lots of guys here handing ladies roses then letting you walk with them for a minute or so, then come back and ask you for money. Having seen this before, Theresa held up her hand to wave off the first guy and he still stuck a rose in between her fingers on her hand with the brace on it. She wasn’t having any of that though and he took them back. For the many many times after that, Theresa just kept her hands by her sides. 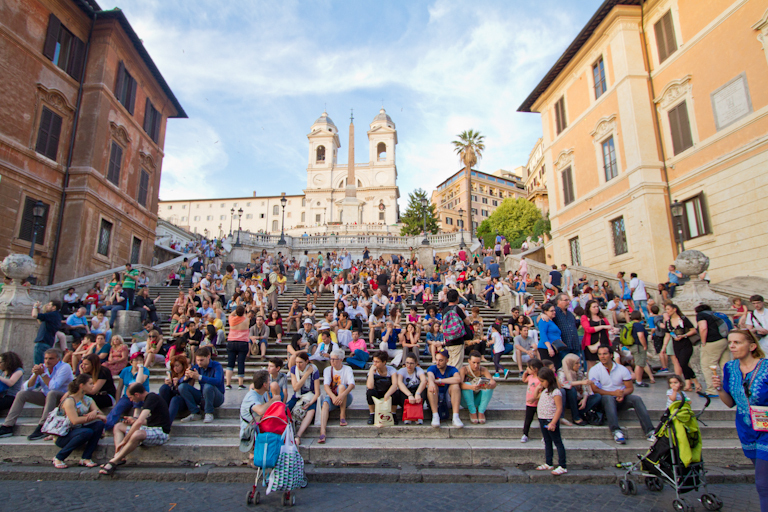 We sat at the bottom of the steps by the Fontana della Barcaccia (Fountain of the Old Boat) and watched as the police patrolled the area and all the illegal vendors ran in the opposite direction. 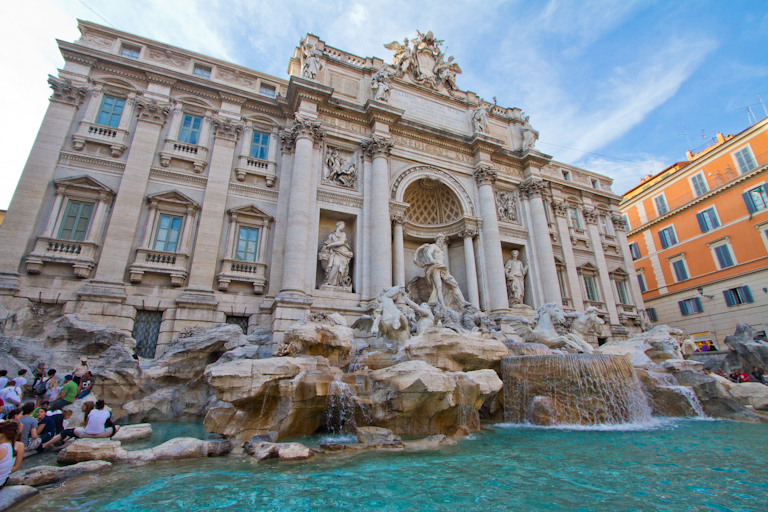 This fountain was actually designed in 1627 by Pietro Bernini and his famous son Lorenzo Bernini. We'll see a lot more of his work later. When I think fountain, I usually think chlorinated recirculated water. Here in Rome though, they were so proud of their abundance of fresh water, that there are multiple free public fountains where you can drink and fill up water bottles. I just take a sip and then we continue up the steps. Lots of people enjoying a picnic dinner here on the steps. The church and obelisk at the top of the steps. There's a good view over the city. Doesn't Theresa look beautiful with these lovely roses? Yeah, here's the zoomed out view of the same picture. T had to get quite stern with this guy to get out of her face. 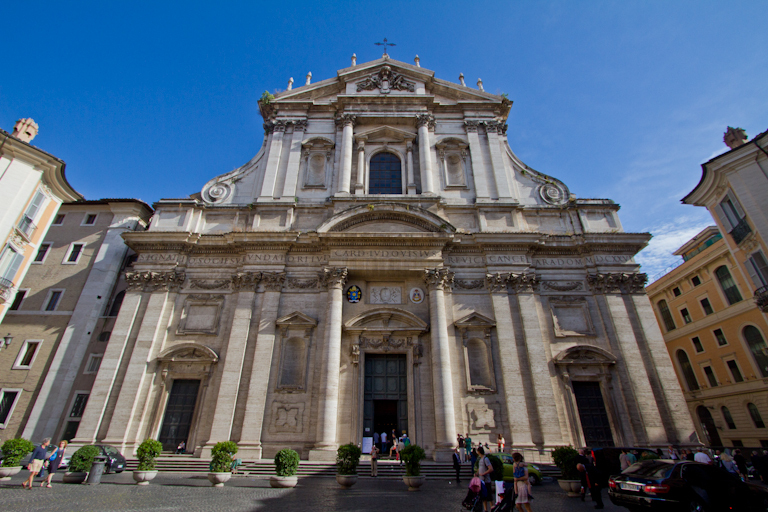 At the top, we explored the church Trinità dei Monti. 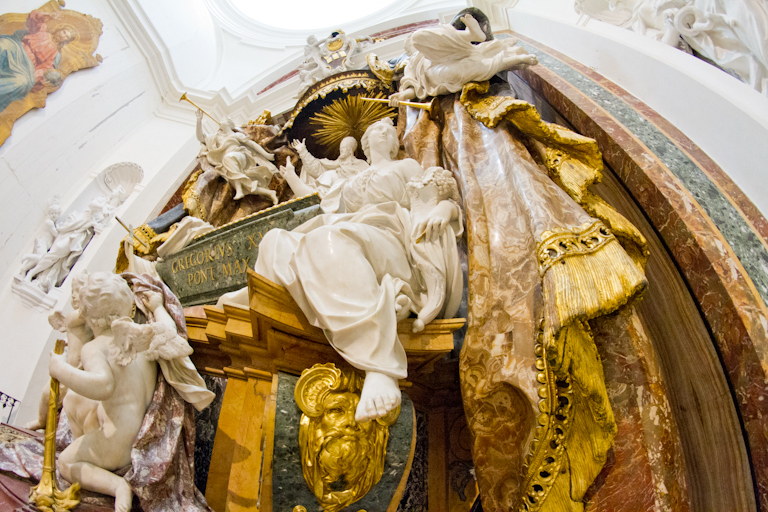 Theresa did warn me though not to take her into too many churches because it was entirely possible to get burnt out on seeing so many of them. That happened in Japan after seeing shrines and temples multiple times a day for many days in a row. As we exited, there was a beautiful sunset over the city. We enjoyed that for a little bit then continued our walk. Back down the steps we went, and just to left was one of the nicest McDonald’s I’ve ever been to. You wouldn’t know it from the outside, but inside there was tons of seating in nice chairs and sofas, touch screen menus, and best of all, public toilets. It's a beautiful sky tonight. T was pretty hungry after not eating much for lunch. On the recommendation of the hotel, we stopped at a high end restaurant. It looked a bit expensive and they required you to wear pants, not shorts, so we decided to give it a go. Without an English menu, we went with the recommendation of our server. Theresa got spaghetti again and I got a spaghetti carbonara. I enjoyed mine. It had cheese, bacon, a cream sauce, plus a zesty kick to it. Theresa wasn’t thrilled with hers though and suggested stopping by a grocery store on the way home for a salad. That girl and salads right now… We were both disappointed by the breadbasket that was so completely burnt we actually sent it back to the kitchen. 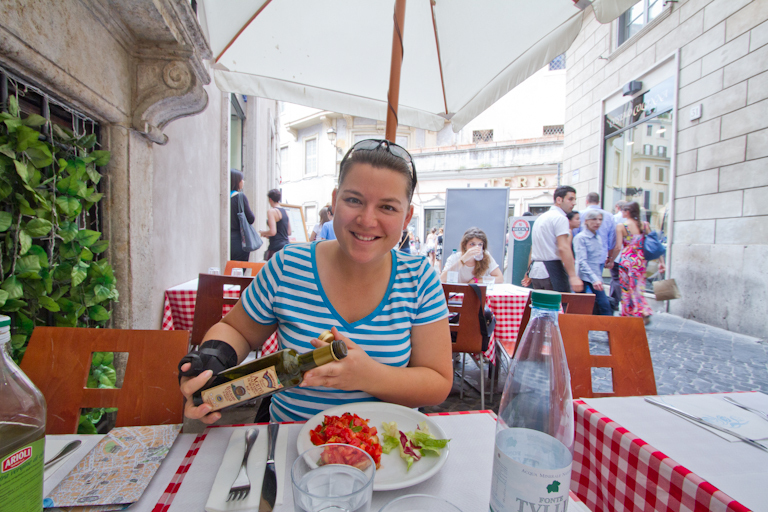 50 Euros ($66) for two plates of simple pasta, a bread basket and a liter of bottled water. We're still waiting for a restaurant to wow us like before. 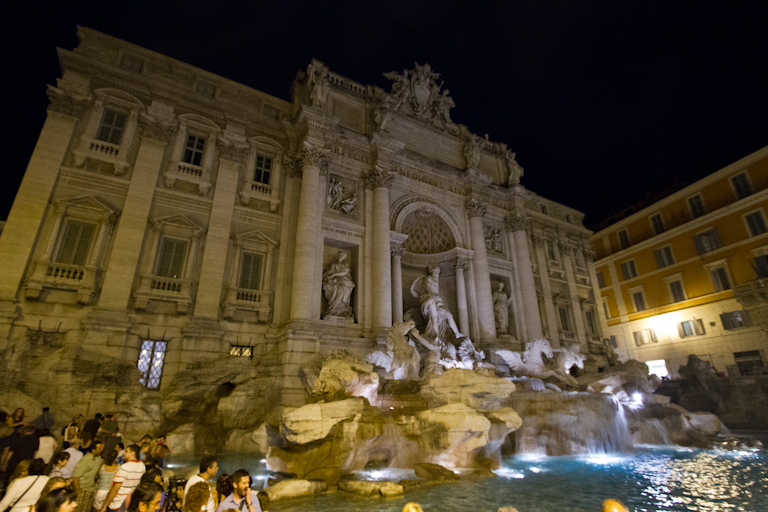 The Trevi fountain is supposed to look even better at night, and since it’s just around the corner, we stopped by. If anything at 10pm it was even busier than before. We’re so happy our hotel is so central to everything. Within a few minutes we were back, but not quite ready to go in for the night. 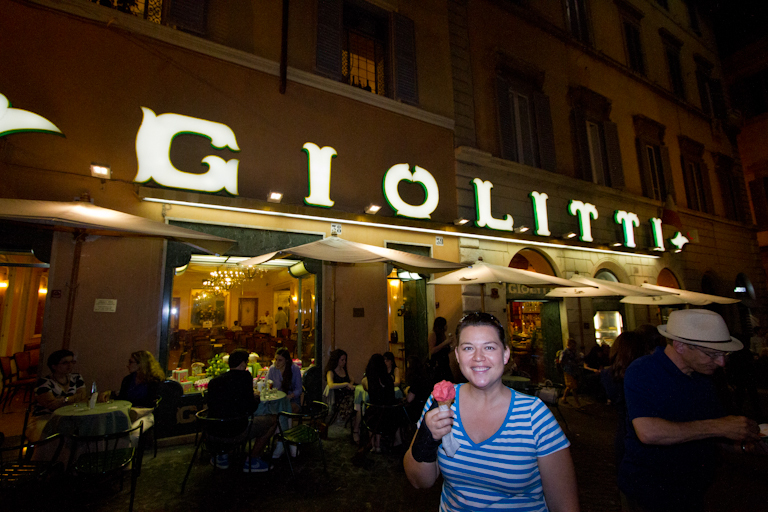 Just around the corner is a place that Roberta and Rick Steves said is the best gelato anywhere. We’d passed it earlier today and the line was out the door and insane. At 10:30 at night, it was only barely out the door. 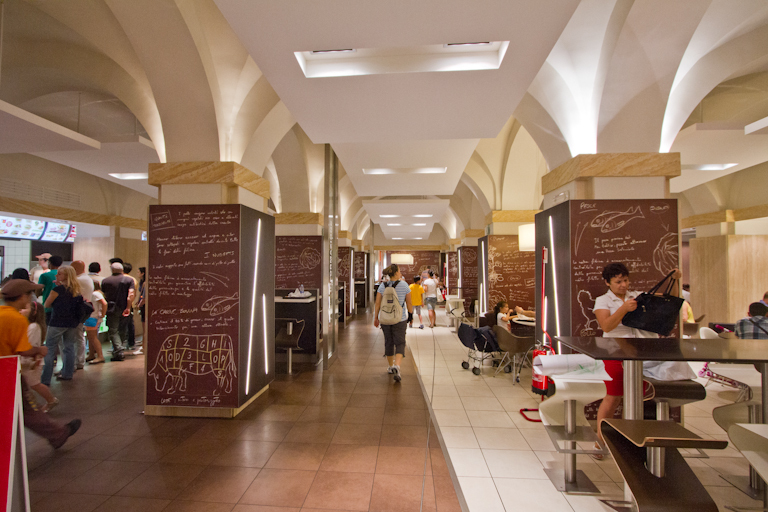 Here you pay for what you want as soon as you enter and then get in line for the gelato at the back of the store. It’s unorganized chaos back there. 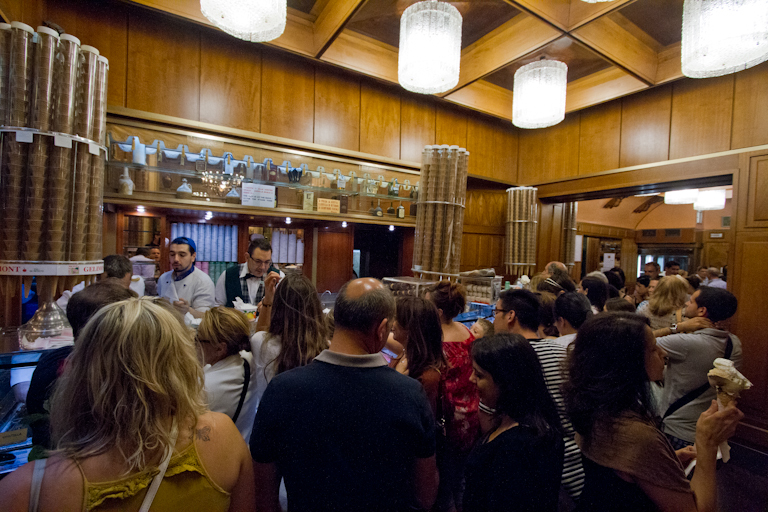 The one line goes to two counters, and the guys scooping the gelato keep telling people to move forward, but then helping the people who were behind you. Theresa told me she didn’t think any ice cream was worth this. After just a little pushing and shuffling, we both got up to the counter and got our cones. T got a strawberry cone that she really enjoyed. Maybe she'll rethink her position that it's not worth waiting in line. I got a super rich chocolate and coconut, and they topped it off with fresh whipped cream. Mine was very tasty too. It's so hard to eat though before it drips all over your hand. When we left our room earlier, we noticed the ceiling had started to drip. I put a towel down to catch the water, and by the time we got back, the towel was soaked and yellow. After telling the front desk, they sent someone up to look at it, and then suggested we move to a different room. 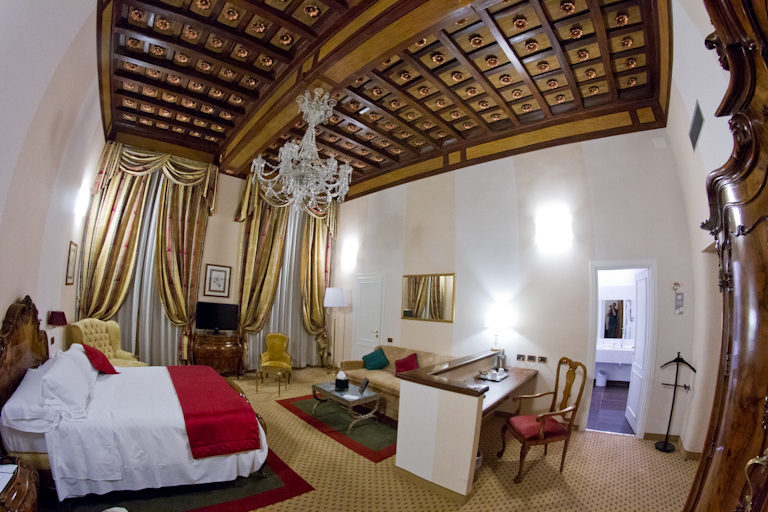 It was still an Executive room and still overlooking the square. Does this room look even bigger? Check out this floor plan I found. Our bathroom takes over 1/4 of the room beside us. To me it looks like the biggest room on the floor. Who'd have guessed after the debacle this morning, we'd be in a room this nice. It’s getting close to 1:15am and I’m hoping my sleep schedule is going to be good tonight. We’ll see what happens! Tomorrow the Coliseum! Amazing how that all worked out with your hotel!! Booking the wrong location is something I have done before... or buying tickets for the wrong night, etc. It's such an awful feeling! I'm glad it was not only resolved, but resulted in a heck of an upgrade! 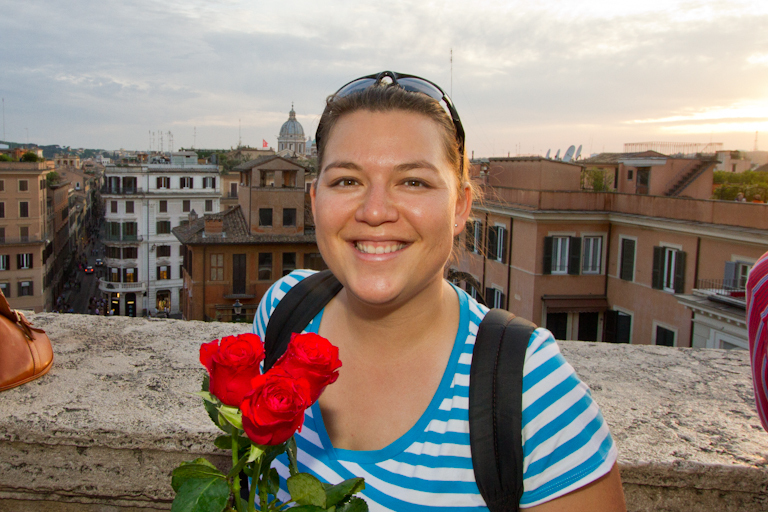 With the unofficial taxis, ripping off tourists at restaurants, and pushy rose guys, I'm a little scared to tour Italy!